South Korean Foreign Minister Kang Kyung-wha met Tuesday with the new US special envoy on North Korea amid signs of Pyongyang and Washington moving to resume dialogue. 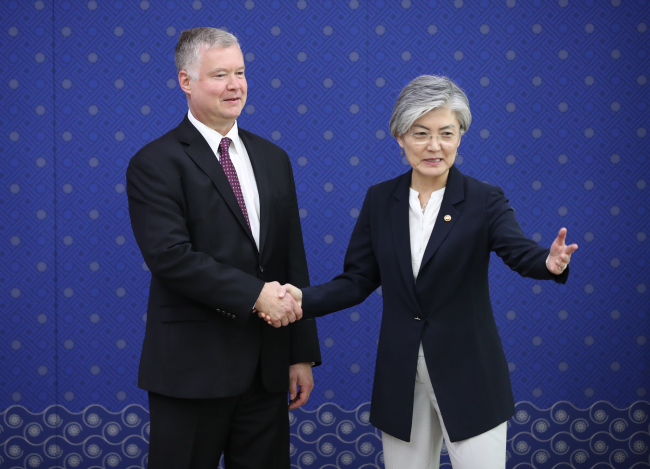 Stephen Biegun, the State Department's special representative for North Korea, arrived in Seoul on Monday as part of his Northeast Asia tour. He paid a courtesy call on Kang just before talks with his South Korean counterpart Lee Do-hoon. Biegun said his visit here is meant for consultations on ways to "make progress in denuclearization and (bring) stable peace to the Korean Peninsula." There is talk of another summit between the North's leader Kim Jong-un and US President Donald Trump, according to the White House. Kim sent a "very warm, positive" letter to Trump requesting the follow-up meeting to their Singapore talks on June 12, White House press secretary Sarah Huckabee Sanders told reporters. "We are open (to it) and already in the process of coordinating," she added. National Security Advisor John Bolton also said at a forum in Washington D.C. that the possibility of another summit with the North "obviously exists." He stressed, however, that the Trump administration is waiting for Pyongyang to take steps to denuclearize.